Turkish Dogs - particularly Anatolian Shepherd Dogs: All That's Left - part II! Soooooo.... Anyway, you probably are wondering what is the story that goes with the above collar pic. To my dismay, our resident collar bandit(s) has demolished yet another collar. 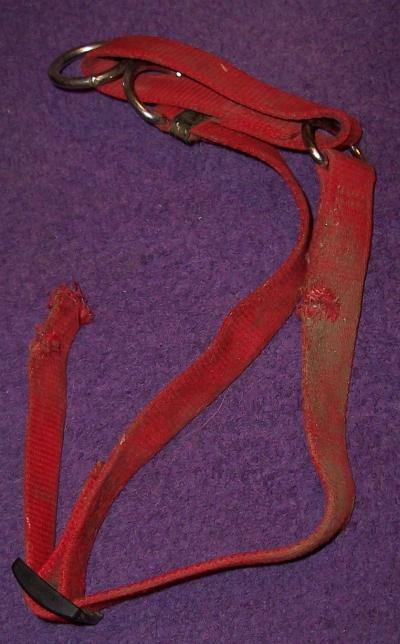 See above, this is was Coco's collar. It's a new one I ordered back in June (didn't get for a month cos the order got lost). I ordered 3 web martigale collars several months ago in the same style but different colors, one each for Ruya, Coco and for Coco's brother, Helmut. Doesn't above remains look a lot like what happened to Ruya's collar? And that's not all, Ruya's collar (a black one this time) has gone missing again! I suspect that pieces will turn up eventually. AND Helmut? Oh yep, I put a nice blue collar on him and his is missing too. Between the three of those guys, I can't keep collars on them! Tags get twisted off and lost too. What to do? I don't want to put tight buckle collars on them for fear that one will get teeth hooked in and there could be a panic that might result in a serious fight if no one is home, but at the rate we're going, this is deja vu. It happened with Ruya and Boone when they were growing up. I think I'll keep collars off the trio for another year or so! Zor (mama) and Boone (adult male) still have their collars but neither of the two care for the neck grabbing war games that the trio enjoy, so it's just a Coco, Ruya and Helmut thing about war games that involve grabbing collars. My first experience with rough coated Anatolians and both Coco and Helmut are turning out to have quite different coats! Don't worry, in a couple of years the pups will lose interest in chewing everything in sight. I wish I knew a source for tougher collars but greyhounds are not known for needing them! I'll enjoy their youth though! Ruya grew out of doing it with Boone (same age as she is, 4.5 years). Now she's a puppy again because of the brats.